Bring a soft, mid-century look to you bedroom with The Curated Nomad Clementina Cotton Duvet Cover Mini Set. The ivory cotton duvet cover features geometric prints with tufted chenille that adds dimension and charm, while the solid ivory reverse complements the eye-catching patterns seen on top of the bed. A button closure and four inside corner ties allow you to place and secure a comforter insert within the duvet cover, for warmth and comfort. Two cotton shams reiterate the designs of the duvet cover, creating a stunning coordinated look. Made from 100-percent cotton, this duvet cover mini set is machine washable and offers a refreshingly soft update to your bedroom decor. In general I didn't think this was a particularly attractive duvet, I was looking for something bohemian, or something that might look a bit collected (not TOO modern) and online it seemed like a good option but in person it was just kind of dull. I probably would have kept it anyway though b/c I'm lazy, however, the center decor/striping was totally not centered on the duvet as shown in the photo. One side of the decor had 37 inches and the other had 53 inches, meaning it was not centered and also not off-centered enough to be intentional. This was clearly an "as-is" item and I did not understand that Overstock sold irregulars. When I returned it it was quite expensive and they did not give me the full amount back (or offer to send a new one) as they would have if it had been irregular. Overall a poor experience with Overstock and has made me shop elsewhere online (with retailers with better customer service policies) ever since. This is a very pretty duvet cover and sham set. It looks beautiful on my bed. My bedroom is white, light grey and white so it matches very nicely. The two large 26 x 26 pillow cases and small rectangle pillow are from the colllection but were purchased separately. I also purchased the two small white pillows and medium rectangle pillow separately. There is a grey throw at the foot of my bed and isn’t part of the duvet design. Great quality and I would definitely purchase another one if needed. 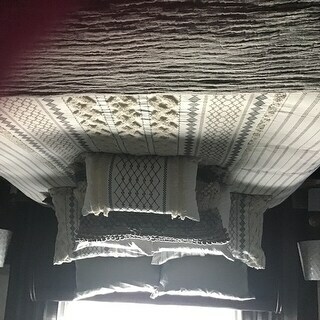 Love the button duvet enclosure and strings on the inside which made it convienent to tie my duvet insert in and keep it in place. I have my bedroom light on in the picture on the left so the colors in the cover may look different. Do not buy the duvet. I bought the duvet after people saying that the comforter doesn't look like in the picture because it's flat and that there is probably multiple comforters under it to give it that nice look. So I thought i would buy the duvet and stuff it myself with a heavier comforter. I bought an all seaon 400 GSM measured 88x92 like the duvet and let me tell you it's a pain to insert it and the duvet only has latches to tie to the 4 corners of the comforter. So you'll have the sides of the comforter 88 inches by 92 that are not attached to the duvet (the comforter had extra latches but the duvet didn't). It looked horrible. There is no way in hell the original price could be $. I'm returning it. The duvet is pretty just wish some other company could make a better version. If you really like it then I would suggest buying a much bigger comforter so it fill it up till it can't "dance around" in the duvet anymore. I really like the look and style of this duvet cover. It is exactly the style I wanted for my bedroom. I like the textures. The material is a little scratchy, so if that is a concern, you may not like this duvet cover set. I have a really nice sheet set under it and don't notice the scratchiness as a con. The other negative I can think of is that there are not ties in the duvet to attach my down comforter to the corners. We haven't used it enough to notice any major slipping around inside the cover, but if we do I will need to attach ties myself. Love my 3 piece duvet cover set!! I absolutely loved my Duvet Cover Set. My walls are similar to the wall color in the picture and it made my whole room just light up. the duvet itself is very light and I will be purchasing the duvet insert but even on its own its beautiful and fresh. Highly recommend. This is a beautiful duvet set! 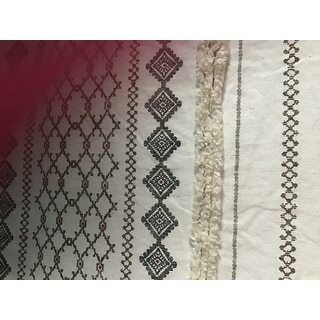 The designs apart from the textured pieces are not stitched. The fabric quality is nice and thick. My full size duvet does not completely fill out the cover. If you are picky about that, you may want to size up to a queen duvet. Super cute and nic quality. I would double heck the size with the size of your duvet insert. I like that this duvet has strips of fabric so you can tie it into the duvet and keep it in place. Absolutely LOVE this bedding set. It looks so perfect with our new wooden bed frame and we ordered the throw pillows shown on the display picture to complete our look. It is such a simple yet stylish look- my boyfriend loves it as well. Not too feminine but yet adds just a clean simple look to our new master bedroom! 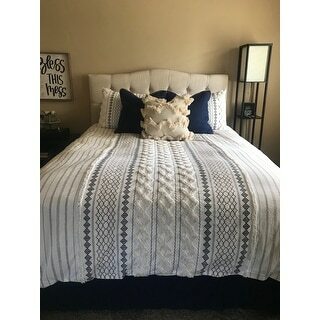 Great quality for the price- hoping the buttons at the bottom holding the comforter in don't break (because I've had that issue in the past with other button closings) but so far so good!! Love this set! My only negative would be, it’s a little wrinkled straight out of the dryer, but a hand steamer does wonders. Poor Quality. Doesn't look like image and sheds lint everywhere! Please save yourself the headache. The quality of this duvet is great! I do like that the material isn't super silky as I have cats with claws who LOVE "kneading bread" on super soft fabrics. It has a thicker cotton feel to it which is perfect. So far, it has also stood up nicely to our pooch who sleeps with us. And it looks just as beautiful as the pictures! Love love love love this duvet set. It was exactly what I wanted. Does not look anything in person as it did on the website. The website appears that it is grey and white. It actually is cream, black and red in color. Much prettier online! Very cute in our bedroom and we really love the weight. We like the neutral colors, but the design it adds to the room is great. True to the description and all the high rated reviews. Highly recommend. I was excited to receive this duvet; however one of the shams was missing. Overstock was great about correcting the problem. It isn't the softest texture but my husband and I have soft sheets between us and the duvet so we don't notice it and love it so far. We've gotten lots of compliments on the look. "is this just the comforter or a set?" This is a duvet set. Includes duvet and shams. "What are the accent colors on this duvet? Looking for Navy." The accent colors are tones of beige and ivory. "When will this be back in stock in king/cal king?" These are back in stock now. "Is the material soft against the skin? We do not use a top sheet under the duvet, so need something that feels good. Also, is the texture on both sides, or just one? Thanks so much!" Material details are: Duvet/Shams % cotton,printed and tufted with chenille, yarn-2/6,base and back fabric. 20 s sheeting. I hope it helps. "When is this product expected to be back in stock?" "Can you confirm what the accent colors are in this item?" Brand, design and price. Also, I had a 15% coupon.